Drink ayahuasca and you may see yourself being eaten by a crocodile. You may find a miraculous resolution to a crippling sadness. Or, more likely, you’ll land somewhere in between. Regardless, you will definitely throw up. Author and ethnobotanist Chris Kilham says all of these things have happened to him after drinking this psychoactive Amazonian brew. If you haven’t heard of ayahuasca, you may soon. While once consumed mainly by natives of the Amazon basin, today, thousands visit Latin American countries every year to imbibe it, with the hopes of seeing profound visions, having religious experiences and—many claim—undergoing immense healing. 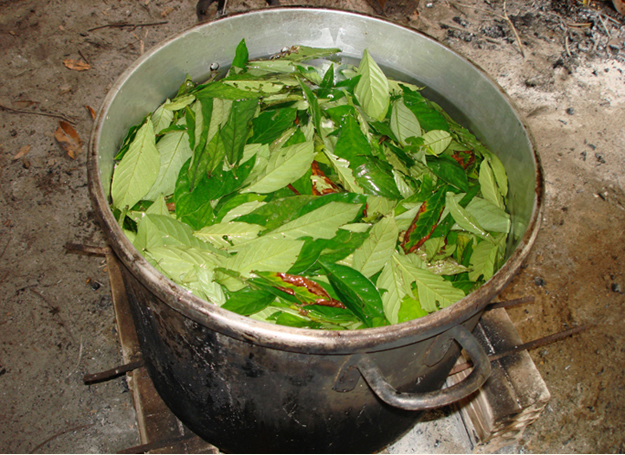 Ayahuasca now has devoted followers throughout the world. 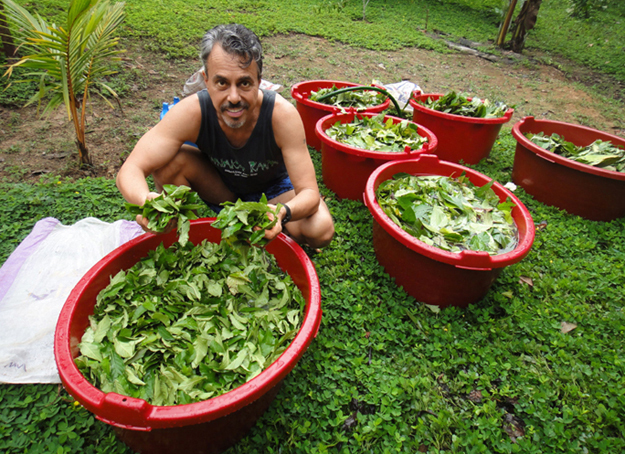 Kilham, who calls himself the “medicine hunter” and has traveled to and intermittently lived in the Amazon for more than two decades, says that he is a firm believer in the healing properties of the drink, which is made from the bark of a jungle vine called Banisteriopsis Caapi, and usually mixed with other plants like the leaves of the Justicia pectoralis or Psychotria viridis. It has been drunk by shamans throughout the region for thousands of years as a part of traditional healing processes: the visions brought on by the brew guided the shaman to the his patient’s problem. Inspired by his experiences with the brew, Kilham has written a book called The Ayahuasca Test Pilots Handbook: The Essential Guide to Ayahuasca Journeying, which he views as primer for people interested in the topic, or a reference for people who have already experienced it. The drink’s psychoactive properties are thought to derive from the presence of a psychedelic compound called DMT. Normally, when a person ingests DMT, the brain processes it quickly and it has no psychoactive effects. But ayahuasca also contains monoamine oxidase inhibitors (from the B. Caapi vine), which prevent the brain from doing its processing job effectively. 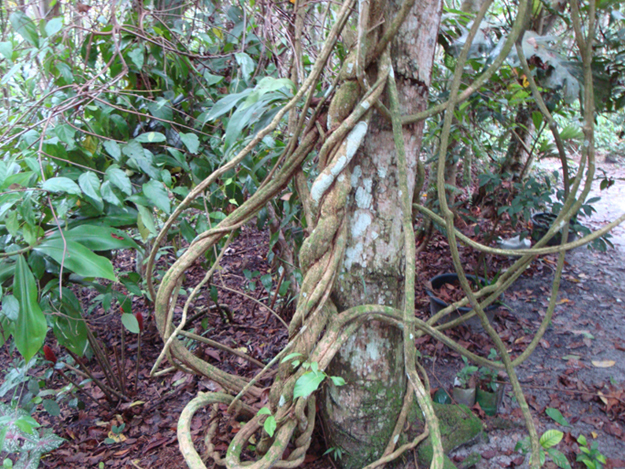 But many, like Kilham, also believe that the ayahuasca experience results from communicating with the plants’ spirits. Far out. I sat down with Kilham—a lively, funny man who sports a moustache and a goatee—to hear about his book and experiences with the brew. How did you first get interested in the Amazon and ayahuasca? When I was young I read a book called Wizard of the Upper Amazon, an account of a man who was kidnapped by tribe of Indians and spent 20 years deep in the Amazonian rainforest under the tutelage of ayahuasca-taking shamans. That staggering account got me interested in plant medicines and the Amazon, where I went to live amongst native peoples in the 90s. And why did you first decide to take ayahuasca? My mother died about nine years ago. I'm normally phenomenal with death and emergencies, and good at helping others out in times of crisis. But when my mom died, I totally fell apart. And after grieving for too long, I realized I needed help. And I don't mean sitting in an therapist's office and talking. I contacted my friend Dennis McKenna and I asked him for recommendations for ayahuasca shamans. He told me about one shaman in Peru, who I went to meet during the end of a trip to the Amazon, where I go all the time. I showed up to this place with three nights to spend. He asked me why I was there, and I told him I wanted to get over the grief and get my energy back. So we had a ceremony and I drank some of the brew. I have experience with some psychedelics, but I was still pretty unprepared for the staggering intensity of ayahuasca. I started having lavish visions, seeing the wheels of the universe turning. And then all of the sudden I was talking to my mother. She said, “just live, dear. Do your work and enjoy yourself.” After conversing for a couple minutes, the grief was gone, and it hasn't come back. And that was eight years ago. That made me a believer in the healing powers of ayahuasca. And then the second night I got my energy back through peculiar means. I saw a gigantic anaconda hovering over me, for hours, pounding the center of my chest so hard it actually felt like somebody was punching me in the chest. I really thought I was going to have cracked ribs when this is over. But of course I didn’t. When that night was done, boy, I had my energy back, I could have run to Bolivia. Have you seen ayahuasca help other people? Of course. I've seen people suffer with psoriasis their entire life cured. One time I accompanied a friend who was addicted to antidepressants for 30 years down to Peru, and then he came out a free man and isn’t depressed anymore. I’ve seen ayahuasca help people with sexual or physical abuse, people in war, people with chronic fatigue. That’s why it’s called la medicina, the medicine, in the Amazon. What’s the craziest thing you’ve ever seen while on a trip? Ayahuasca represents itself in different ways to me, sometimes as an anaconda or a series of continually moving tentacles, opaque and luminous, moving the air around. I experience it as a conscious spirit. Sometimes I run into these three creatures with rubbery pink elephant noses, and they wave hello to me in unison as they go by. I have had a crystal skull vomit gold and jewels into my throat. There are also these robots with tomato-can heads that show up, and I tell them to be on their way. One time I had a group of snakes hovering in front of my face and they went, "can we come into your body through your nose and eat up dark matter?" And I went, “yeah, sure, why the hell not.” And they went in and gobbled it up like Pacman. And I thanked them afterward. Some of the stuff is funny, just ludicrous. But of course much of it is deeply meaningful. You might see entire civilizations rise and fall, you might actually flat out meet God. If you have a direct experience with spirit, it does change you—it becomes part of your psyche, your nervous system. You recognize the unity of all things, you act directed by that, and it modifies how you live. It sounds almost too good to be true. And I know some people would be afraid of losing their minds taking something like this. What would you say to somebody who thinks that way? If you think ayahuasca is not for you, don't do it. I never push anybody. I believe that the mind is extremely strong and elastic, in most cases. But if a person is fragile, fragmented or disturbed, I would not suggest that they drink it. A lot of people legitimately and understandably approach ayahuasca with trepidation, because these agents are ego-shattering. Our sense of self is our identity. And if this is shattered, it can be very scary. I’ve had some scary nights. But generally the worst-case scenario is that you will be scared. So you might have a few nights that aren't necessarily pleasant, or on the other hand you could spend the whole night bathed in a sea of love and ecstasy, and you feel gratitude and overwhelmed by the beauty and connectivity of all life. But nobody can really say what will happen. And of course, like other psychedelics, ayahuasca is not for everyone, and is obviously very powerful. When you take ayahuasca do you still know where you are? Yes, unless you drink too much, then you may completely forget where you are. As they say, you can always drink more, you can never drink less. A skilled shaman can help you find your ideal dose. But otherwise you know perfectly well you're on a mat, you drank ayahuasca, and the shaman is singing, you’re surrounded by others, and you’re going to come down soon. How long does a trip last? The intense part last for about 4 hours, though you feel the after effects for a while after that. You drink it at 8 p.m., your ride is probably significantly diminished by about 1 a.m.
Is it understood how ayahuasca works? No, it's not. But it’s generally thought that these agents basically cause a reset of the limbic system, and that it normalizes levels of neurotransmitters like dopamine and serotonin. If you want to dive into deep end of olympic ayahuasca pool, though, there's the spirit explanation. Shamans who work with spirits of the plants insist, as do I, that the plants are assisting us. But a lot of people in our culture bristle at the the idea of plant spirits, which is ironic. As we remove ourselves further and further from our basic natural intrinsic connections, and lose our connections to land, air, water, plants and forests, we become more suspicious of and skeptical about nature. But the fact is, we are natural beings, we coevolved with plants, we couldn't exist without them. With instrumentation we can assess the electrical activity of brain, skin—this is energy. It's not ludicrous to assume that there are energetic forces that are not necessarily visible that we are engaging when you take ayahuasca [or other psychedelics like magic mushrooms]. But we haven't found adequate scientific ways to deal with plant spirits, and we may not ever. And perhaps it’s good that mysteries about it remain. Some people may think it sounds crazy. But a lot of things sound crazy before they are well understood or accepted. If I told you centuries ago about radio—that I could have a magic box that will register invisible waves transmitted from somewhere else to play music—I’d be hanged as a lunatic. Well, all I can tell you is that in my work I'm called by plants all the time. And when I encounter scientists or herbalists or doctors who work with plants, especially the medicinal value of plants, I always ask them: “Are you working for the plants, or are the plants working for you? And they pretty much always say they are working for the plants. There’s a sense of being called, being enlisted by the plants. And these are mostly not people who have taken psychedelics. I have heard of people taking ayahuasca in the United States, such as in New York City. Would you recommend that? I definitely don't recommend drinking here. For one thing it’s illegal. If you want to drink, go to South America where it’s legal and part of their heritage, and they praise it. There was a New York Times article about taking ayahuasca in Bushwick, Brooklyn. That was crap. It isn't about swallowing a drug. It's about engaging in an experience. It is not to be trifled with. It's not mushrooms or a hit of ecstasy. I can’t imagine taking it in an apartment and going home on the subway. I mean, are you kidding me? And people have to be careful about selecting their shamans. Ceremonies shouldn’t be done by somebody who has just done it a few times. I, for example, would never conduct a ceremony—I’m not a shaman. Shamanic training takes every bit as long as medical training.